CL Tests Reveal the Best Probiotic Supplements and Probiotic Drink for You (and your pet)! Make sure the probiotic supplement you take passed our tests! With so many different probiotic supplements on the market providing different amounts and strains, how do you know which provides the best quality and is right for you? And how do probiotic drinks, like kombuchas, compare? How many probiotic cells do they contain, do they offer the same benefits as a supplement — and how do they taste? 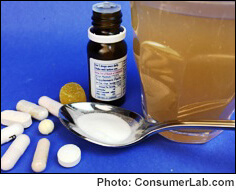 If you are taking a probiotic to help with a specific condition, it is important that you first select a probiotic that provides the specific bacteria or yeast shown to help with your condition, such as irritable bowel syndrome (IBS), abdominal pain, colic in infants, infections, diarrhea, cold and flu, and even high cholesterol, anxiety, mania, dandruff, and weight control. Our report explains the clinical evidence and what to look for to suit your needs. And, you'll need to know if the product contains its listed amount of viable (living) probiotic organisms. While our tests identified many high quality probiotic supplements, we also found huge differences in the number of viable cells products provided in a daily serving -- from just 100 million to 1.8 trillion! We also found one product for pets contained just 5.3% of its listed number of cells. Among the probiotic supplements that passed our laboratory tests, provided good amounts of viable cells and were well priced, we selected our Top Picks, including products for digestive health, products for women children, pets and oral health. We also selected a Top Pick among probiotic-containing drinks which also provided a good amount of viable cells, passed our tests of quality and was judged favorably in our taste tests.